Welcome to Adulting with Kids, where we empower moms by translating child development research in a way that is engaging and easy to implement. Feel free to browse around and stay a while! I don’t know about you, but out of all the different life skills a mom teaches their child, potty training always seemed the most challenging to me. I think it is because potty training is so unpredictable and there are so many different opinions regarding the right age and method of potty training. So here is my confession: I started noticing signs of potty training readiness with my first born when he was 18-months-old, but I was scared and felt unprepared to potty train. I began to read, asked other parents questions, and procrastinated potty training for my Jack for about 4 months! Once I finally started potty training, I learned that potty training is a game of determination, patience and consistency. When my little girl started showing signs of potty training readiness at 18 months, I did not hesitate and used the below plan that had worked with my first one to successfully conquer potty training! Bladder and bowel control is a maturation process and the child’s initiative (in other words, the signs of potty training readiness that we will discuss) is an indicator of the readiness of potty training. This means that intense potty training at an early age will not make you more successful in potty training if your child is not ready. What will make you successful at potty training is watching the signs of readiness and being prepared to act once those signs are present. In my experience as a mom, signs usually begin at around 18 months of age, but of course, every child differs. For example, studies show that girls achieve toilet training skills faster and at an earlier age than boys. So be sure to use your mommy instincts to look for those signs of readiness before you get to potty training. With that being said, let's go over a few tips! 1. Watch for signs of readiness, like saying potty, or pointing or wanting to sit on the potty, hiding when they potty, holding their potty for longer periods of time, etc. 2 . Make the decision to potty train and stick with it! Once you start, there is NO going back! Once I made the decision to potty train, I used up all of the diapers I had left and NEVER bought them again. I used pull-ups for nap time and bedtime because I potty trained for day time and night time at different times. This worked well for me, but I know many moms who do it at the same time! I can write about this at a later post. Both kids were potty trained day and night by 2 years old. 3. Choose a time to potty train and stay home. I understand this can be extremely hard to do, specially if you have other siblings or have a full-time job. However, it is important to be consistent for a good amount of time in order for your training to be the most effective. A good tip might be to do it over a holiday weekend where you can get some help from your spouse or other family members. If your child goes to daycare or has a caregiver, ask them to continue your plan if possible. 3. Decide the tools you would like to use to potty train. I personally liked the toilet insert like this one because I can flush and don’t have to worry about cleaning an additional toilet, but just use what would work best for you. 4. Purchase a good supply of your kid's favorite healthy treat! For example, my little girl loved raisins so I used them as her treat. I used individual ziplock bags to make little treat bags to use as a reward when my little one sat in the toilet, told me she had to go potty, or went potty in the toilet. They might just sit on the toilet to get a treat a the beginning and that's okay! 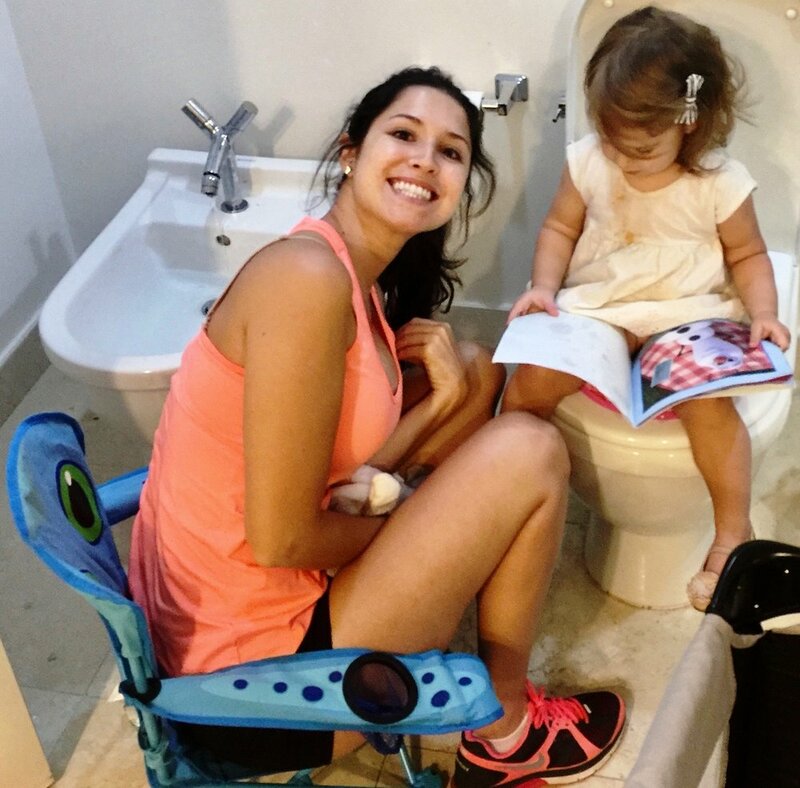 You want your little one to become as familiar and comfortable with the toilet as possible. 5. Purchase cute underwear that they love!!! For mine it was Thomas the Train and princess ones! Let them look at them and smell them- This will encourage them to stay dry to keep their underwear looking and smelling good (this worked specially well with my girl). Show them that their mommy and daddy and sibling (if they have one) wear big kid underwear! and so will they! 6. Begin the night before explaining what you will be doing... yes, I am huge on explaining EVERYTHING to my kids (I will post a later blog on this). I simply tell them that something super exciting is happening tomorrow!!! We are going to learn to go potty in the toilet like mommy and daddy and brother!!!! And we are going to get to wear big girl underwear!!!! Yayyyy!!!! 7. The next day when they wake up, get them excited by saying, "Yayyy! It is potty in the toilet day!" Take their diaper off and show them their new potty seat. Show them their underwear! Tell them, "Look, aren’t these cute?!! and they smell yummy!!!!" Smell their diaper (well, pretend to smell lol) and say, "That smells yucky!" Now sit on the toilet and say, "Look mommy is going potty! Yay, mommy!!! And I get a treat because I went potty!" Give yourself a treat out of the treat bag that you have pre-made the day before! 8. Use their favorite stuffed animal or toy and reenact going to the Potty. For example, say "Mickey says he has to go potty!" so then say "Runnnnn Mickey!" and sit Mickey in the toilet. After Mickey goes to the potty, give him a treat. Do it over and over and tell your little one, "Tell me when you have to go potty and we will runnn together!" Make it fun! Make it a game! Make it a PARTY! 9. Give tons of fluid! And I mean TONS!! You want as many opportunities as possible to teach. 10. Make the toilet fun! I did a lot of toilet reading, singing (I made up our own little song), stickers, anything! You want this to be a good experience for them, and for them to actually want to sit in the toilet. 11. But just so we are clear...You WILL have a lot of accidents! And that is just part of the learning process. It isn't fun, but it is normal! As you watch your little one like a hawk and they start to go potty on the floor, pick them up and say "runnnnnn to the bathroom!" We have to go potty!! They might stop mid-stream or you might get peed on.... and that’s okay! But trust me, it will help make the connection of brain and bladder control! I would say it took my kids a whole week of continuous training before I felt confident they would not have an accident every 30 minutes. 12. Every time your baby goes to the potty in the bathroom, make a big deal, give them a treat, and celebrate!!! Tell everyone in the house what just happened! 13. When you are ready to go out I purchased padded underwear like this one to make the accidents less messy and to prevent backtracking with diapers. I did use pull-ups for naps and bedtime because my kids were so young, I did night-time potty training at a later time. But other than that, diapers were a thing of the past in my household once potty training started. 14. Once that first week has passed, take your baby to the potty every 30 minutes if you are home or every time you arrive somewhere, in the middle of the visit, and before you leave. This will make it easy on you so that the amount of accidents decrease. It took about 3 months before I felt completely confident that there would be zero accidents, and even then, I took them potty before we went anywhere, when we arrived, in the middle of the visit and before we left! That’s a lot of work you, might think! It is inconvenient! and the answer is yes, it is!!! And trust me, if I could see you on the other side, I would give you a trophy and a mani/pedi and a massage, because boy, would you deserve it. But from this side of the computer, I just want to say that You can do it!!! Your little one can do it!!!! 2.Schum, T. R., Kolb, T. M., McAuliffe, T. L., Simms, M. D., Underhill, R. L., & Lewis, M. (2002). Sequential acquisition of toilet-training skills: a descriptive study of gender and age differences in normal children. Pediatrics, 109(3), e48-e48. Be the first to know about new posts and giveaways!